PENSACOLA, Florida – After University of West Florida President Judy Bense declared last fall that the school would be starting football as a varsity sport, many fans wondered for months who would be tabbed to lead the fledgling program. When Dave Scott, UWF’s director of athletics, announced Pete Shinnick as the inaugural head coach for the Argos, the face of the team became a little clearer and a little brighter. Executive search firm Collegiate Consulting played a role in landing the new head coach. The Atlanta-based firm launched a national search with UWF administration and provided executive search aid from areas like job announcement advertising to developing a qualification matrix and providing recommendations to the University. Shinnick, who spent the last eight years as the head coach for UNC Pembroke, reached out to Russell Wright, Collegiate Consulting’s managing director. From there on out, the coach knew where he wanted to be. “I liked that Collegiate Consulting was involved from the beginning,” Shinnick continued. “It allowed me to discuss the position more discreetly while the firm was involved. When firms like Collegiate Consulting are involved, you are able to get questions answered and have access to more information without exposing yourself. I was able to ask a ton of questions and get valuable feedback from Russell. Even though the Argos first season of competition isn’t until 2016, Shinnick hasn’t had much time to relax. Since landing on campus in February, the coach has been meeting with UWF boosters and supporters of the program. He has hit the road as well, assembling his first recruiting class and visiting other camps throughout the Southeast, including Les Miles’ spring practice at LSU. Last week Shinnick announced the first two hires on the Argos football staff. Shinnick knows the drill. He did it once before at UNC Pembroke, guiding a fledgling program from its inception to a 50-24 record in seven seasons. In 2009 the Braves became the youngest program (three years) to advance to the NCAA Division II playoffs. And he aims to do the same at West Florida. About West Florida Athletics: The University of West Florida Department of Intercollegiate Athletics has won seven national championships, and UWF leads all schools in Gulf South Conference history with 75 league championships and 16 all-sports trophies. Football will be the 15th varsity sport at the University. President Bense confirmed on Sept. 4 that the team will begin playing in 2016, and the University reached an agreement in concept for the team to play its home games at Maritime Park Stadium in downtown Pensacola starting that fall. For more information on football at the University of West Florida, visit www.GoArgos.com/Football. 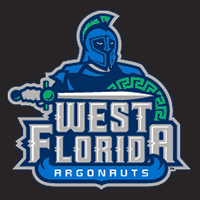 For information on all UWF athletics, visit www.GoArgos.com.